Elderberry is really having a heyday right now. You’ve probably heard of elderberries and their cold-busting superpowers, but what you might not know is how easy it is to make a simple elderberry syrup recipe to save money and have a powerful natural remedy on hand whenever you or your family needs it! Elderberries make a wonderful tool for wellness when you use them right. One of my favorite ways to use elderberries is to just let a few steep in my herbal tea each morning, especially during cold and flu season, but when I have a bit more time I also really enjoy making homemade elderberry syrup! Some people also use elderberries to make wine, gummies, or an elderberry tincture. There are so many uses! One of the most popular is definitely the syrup, though. It’s kid-friendly and tastes so good, you’ll forget how good it is for you! Learn all about elderberry syrup benefits and side effects here, and an elderberry syrup recipe to help you learn how to make your own homemade elderberry syrup for immune support for your whole family! This website contains affiliate links- meaning that if you follow a link to something I recommend, I might receive a small commission at no extra cost to you. I only recommend products I love! More info here. And please note that I’m not a doctor- I’m not making any claims, and this recipe isn’t meant to treat any disease. Elderberry (Sambucus nigra) comes from a tree that grows in the wild, but you can also grow an elderberry tree in your backyard. Besides being pretty little berries, elderberries are good for a lot of things. They’re rich in vitamin C, dietary fiber, antioxidants, and more! Other herbs that help support the immune system and help to fight microbes include goldenseal, barberry, osha, and echinacea. Overall, elderberry syrup has plenty of health benefits for a low cost. Elderberry syrup works by gently supporting the immune system to reduce your chances of getting sick and could even help lower your chances of getting the flu. It also aids in a quicker recovery if you do get a cold or the flu! If you want to make your own elderberry syrup, you’ll need to get some high-quality elderberries. In some areas, you can forage for wild elderberries (Sambucus nigra), but make sure you’re getting them from somewhere free of pesticides and away from roads. Look for blue or black berries. Red elderberries aren’t medicinal. You can learn more about foraging for elderberries from Grow Forage Cook Ferment. 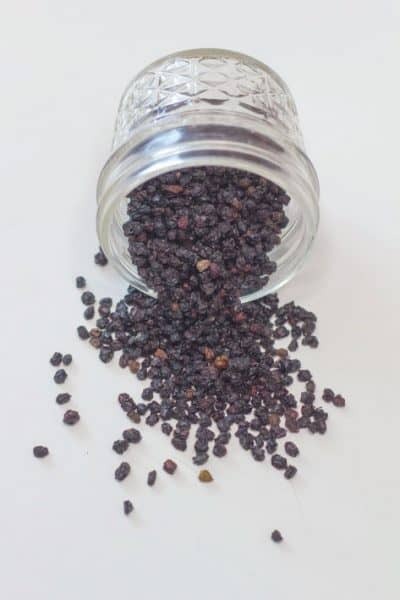 If elderberries aren’t in season or aren’t in your area, you can also buy dried elderberries online. My favorite place to get bulk supplies for herbs and natural remedies is Starwest Botanicals, but you can also get dried elderberries on Amazon. If you aren’t the DIY type, you can buy elderberry syrup at your local health store or online, or you can even get elderberry cough drops or yummy, kid-friendly elderberry gummies! My favorite destination for all-natural, effective herbal solutions, Earthley, also has a 1, 2, 4, or 8 oz. elderberry elixir herbal extract– this isn’t a syrup, it’s an extract- IE. even more bang for your buck! The elderberry and other nourishing herbs give you powerful daily immune system support. There’s an alcohol-free version for kids too. Starwest Botanicals also has a fantastic organic elderberry extract. You can use the drops on their own, or add it to water or your favorite smoothie! It doesn’t take many drops from an elderberry extract to help you feel better quick. If you’d like to take the DIY route along with some guidance, or you just want to take the guesswork out of making your own home remedies, I’ve got a solution for you! 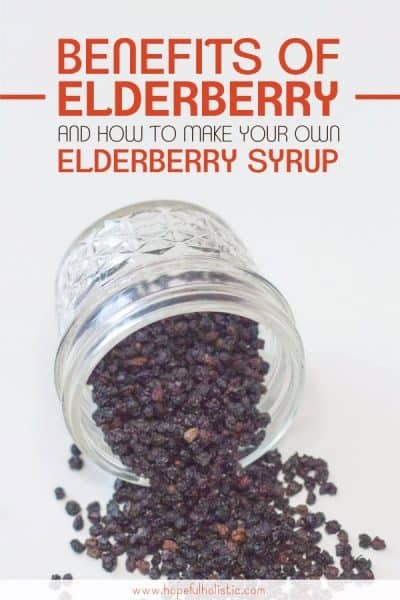 You should try an elderberry syrup DIY kit from Earthley. This kit has organic herbs and a recipe card, all you’ll need to add is water and honey! There aren’t any synthetic vitamins, flavors, or preservatives, nothing but what you need to make a safe, effective elderberry herbal syrup. Making elderberry syrup is actually pretty dang easy. There aren’t a lot of steps, and it’s a fun recipe to get the kids involved in! 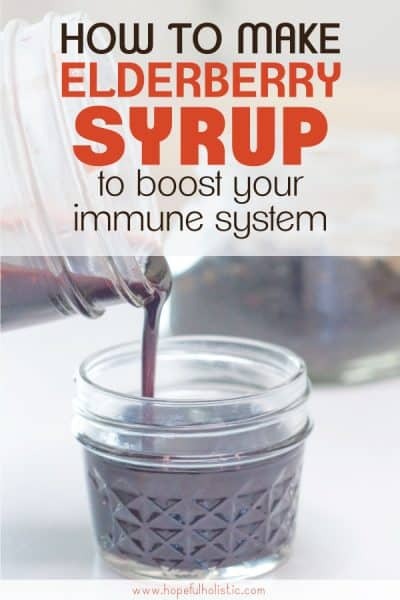 I think this is the best elderberry syrup recipe to help your immune system because it doesn’t include sugar or any thickeners or fillers that will hold your immune system back from its full potential during cold and flu season. This elderberry syrup is made without sugar, just all-natural ingredients, making it healthy and even better for you when you’re sick. There are notes below on how to make a thick elderberry syrup without honey so that it’s safe for young children. You can also sweeten it with any time of sweetener you want. Scroll down for the recipe! Elderberry syrup is easy to make, delicious, and so good for you! It does need to simmer for a while and cool down for a couple of hours, so pick a time when you aren't rushed to make some yummy homemade elderberry syrup. Combine water and elderberries in a pot over medium-high heat, stirring regularly. Turn heat down to a simmer once it comes to a boil. Do not cover. Simmer over medium-low heat, stirring regularly. Remove from heat after the liquid has reduced by half, which should take 30-45 minutes. Let cool to room temperature or just slightly warmer. 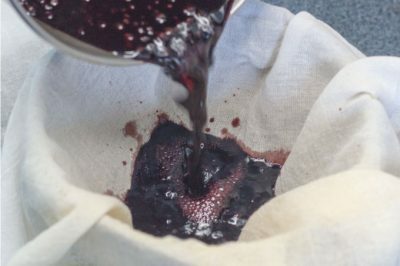 Pour elderberry juice into a bowl with a flour sack over it, squeezing out all the liquid. Mix in honey. Store your elderberry syrup in a glass jar in the fridge, and use within 2 weeks. Try adding cinnamon, cloves, ginger, or other spices to create an even more flavorful syrup! For young children, substitute vegetable glycerin for honey. Of course, the basic recipe for elderberry syrup is perfect all by itself. But if you want to change things, substitute ingredients, or make your elderberry syrup even more awesome, take a look at these recipe notes for ideas! If you’re using fresh elderberries, use twice as much (2 cups of elderberries with 4 cups of water). Make sure the berries are clean and pick out any leaves or stems. Don’t give elderberry syrup with honey to children under 1 year old. Instead, sub the honey for vegetable glycerin. Try adding cinnamon sticks or powdered cinnamon, cloves, powdered or fresh ginger, or other spices to flavor your syrup. I added 2 cinnamon sticks, 10 cloves, and a couple shakes of powdered ginger to mine. Don’t cover the pot. Steam needs to be able to escape to allow the liquid to reduce down. Stir gently- if you don’t stir too crazy, your syrup will leave a light ring around the pot as it reduces. This makes it easier to tell when it’s reduced by half! Elderberries can leave a stain– clean up any spills quickly. It might color your hands slightly when you’re squeezing it out of the flour sack too. You can compost the leftover berries and any cinnamon sticks or spices. 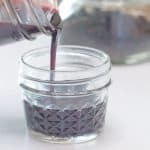 If you want to make elderberry syrup with a low-carb sweetener (such as monk fruit or stevia) but still have a thick syrup, follow the directions below using whatever sweetener you want. One thing about elderberry syrup… It takes a lot of honey! 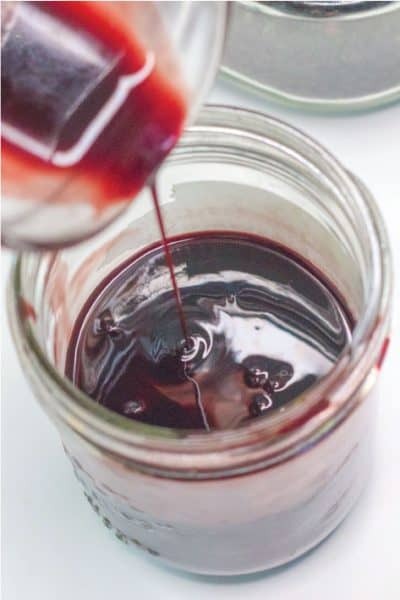 This helps sweeten it and give it a thick texture, but it’s completely possible to make a thick, low-carb elderberry syrup with whatever sweetener you want! This recipe is perfect for anyone on a low-carb or keto diet, or for those times you don’t have tons of honey on hand. If you’re keto, you still won’t want to eat lots of this even if it has a low-carb sweetener. Stick to about a tablespoon or less per day. I used about 2 tablespoons of a monk fruit/stevia blend, but you can use whatever you want! Try xylitol, maple syrup, or coconut sugar (those last two options aren’t low carb). There isn’t a set amount of sweetener to use in this recipe because all of these options will sweeten the syrup differently. Just start with a little and if it’s not sweet enough, add more. The secret ingredient for thickening elderberry syrup without honey is arrowroot powder. This stuff is amazing- it’s so much better for you than cornstarch or flour, and it thickens just about anything without adding a weird taste! I’ve used arrowroot powder to thicken gravy, sauces, drinking chocolate, and more. It’s definitely worth having some on hand if you like healthy cooking. 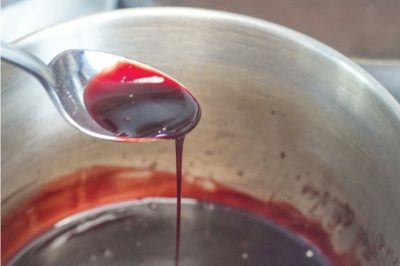 Here’s how to make a thick elderberry syrup with arrowroot powder! This elderberry syrup uses whatever sweetener you want! Use arrowroot powder to make a healthy, thick, pourable elderberry syrup. Combine dried elderberries and filtered water in a pot over medium-high heat until boiling. Turn heat down to medium-low and simmer for 30-45 minutes or until liquid is reduced by half. Let mixture cool, then strain out berries using a flour sack. Return liquid to heat, and warm over medium heat. Whisk in arrowroot powder, stirring constantly, for 10 minutes or until desired thickness. Store elderberry syrup in a jar in the fridge, use within 2 weeks. There is no set amount for sweetener because each option has different amounts of sweetness. Try 1 tbs of a monk fruit/stevia blend, or 2 tbs maple syrup. 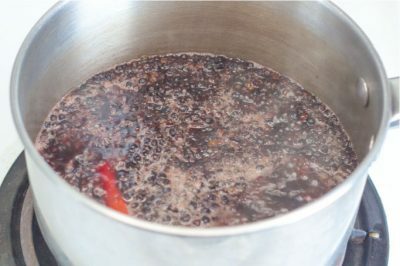 I haven’t tried making elderberry syrup with an instant pot, but I’ve heard it’s possible! If you have an instant pot, you can whip up some tasty elderberry syrup in no time at all. Just put everything (except for your chosen sweetener) into the instant pot, then set it on manual for 9 minutes. After that, vent and strain like normal, and add your honey. That’s it! Of course, you can just have a spoonful of elderberry syrup and get lots of benefits, but there are tons of other creative and delicious ways to use elderberry syrup! I’ve got a source of inspiration for even more ways to use your homemade elderberry syrup too. If you want to learn how to make elderberry recipes like fermented elderberry honey, frozen elderberry drops, elderberry caramels, and more, check out my elderberry recipes board on Pinterest! If you just want to take your elderberry syrup straight, for maximum immune benefits, follow the dosage recommendations below. Elderberry is safe when consumed as a regular syrup or for a special treat, however, if you want to use it for preventing or helping to get over an illness, you can take it a bit more regularly. If you’re taking multiple doses throughout the day, take them at least a couple hours apart for best results. For adults: Take 1 tbs once a day for prevention. During sickness, take 1 tbs 3-4 times daily. For kids ages 2-12: Take 1/2 tsp daily per 30 pounds of body weight for prevention, or twice a day for sickness. For kids 6 months to 2 years old: Don’t feed honey to babies- use vegetable glycerin to thicken the syrup instead. Take about 10 drops a day for prevention, or 2-3 times daily for sickness. If you’re just starting to give a young child elderberry syrup, start slowly and make sure there are no adverse reactions to the syrup before giving them more. Don’t give elderberry syrup to babies under 6 months old. Although elderberry is very safe (much more so than pharmaceutical drugs) there are a couple things about elderberries that you should be aware of. You don’t need to fear elderberry syrup dangers as long as you follow the recipe and don’t drink buckets of it! Keep in mind that I’m not a doctor, and you should see your doctor if you’re sick for extended periods of time. First tip- you’ll need to make sure to simmer your berries for at least 30 minutes. Elderberry seeds have a cyanide-like toxin in them, and they need to simmer over heat to become for consumption. Don’t eat raw elderberries- they might make you nauseous. If you’re giving elderberry syrup to any children under 1 year old, make sure it doesn’t contain honey. Substitute vegetable glycerin to make it safe for babies 6-12 months old. Elderberry syrup is also safe while pregnant or nursing. There have been reports of people with elderberry allergies. Start with a small dose to make sure it agrees with you. And this might go without saying, but if you think you might be having an allergic reaction, don’t take any more elderberry syrup. Some people have also claimed that taking elderberry constantly can over-activate your immune system. This isn’t quite true. Elderberry is actually an immunomodulator, meaning it helps boost your immune system when it needs a boost, but it also calms down your immune system when needed. It’s fine to take regularly over periods of time. For more information on elderberry benefits and lots of studies and research on what it really does to your body and immune system, check out this post: Is elderberry really the best flu remedy? Hope you feel great and enjoy your elderberry syrup-making adventures! Hubs is right! He also thinks that the syrup is best on his homemade pancakes or waffles.